THE SEARCH FOR EMERGING CREDIT UNION LEADERS IS ON! MORE THAN $50,000 IN PRIZES WILL BE AWARDED, PLUS THE TITLE OF THE CUES NEXT TOP CREDIT UNION EXEC. CUES is looking for young professionals, 35 and under, to apply to become the Next Top Credit Union Exec. The Next Top Credit Union Exec challenge allows young credit union professionals to stand out amongst their peers, and be recognized for the work they are doing to advance their credit union and the movement. It provides finalists and the winner with educational credits to help them further their careers within the credit union industry. In this show, Lynette Cupps, CIE, VP/organizational Development with $1.3 billion MAX Credit Union in Montgomery, Alabama, describes her excitement at being named 2018 CUES Next Top Credit Union Exec. Cupps also talks about her project—how to support non-profit organizations by partnering to provide training for their staff and volunteers; this year’s competition process; and where to go for information on participating in next year’s contest. “It was such an honor to be considered and to see the rally of support my idea had and the way that we can support these non-profits,” Cupps says in the interview. Winning was “really unreal because I was so honored to be among the (five) finalists. The other finalists had such good ideas. … Any of them would have been incredible winners. A Twin Cities-based credit union is offering a different type of loan. It's for families needing financial assistance with adoption - a very common, but expensive decision. Firefly Credit Union's adoption loan has been in existence for less than a year, but already a dozen families have taken advantage of it. "We said what's easiest for the borrower and how can we make this a seamless process for them," Firefly Community Engagement and Communications Specialist Geoff Bullock said. Bullock has two adopted children himself. And his experience told him something had to be done to make it easier for families financially. "We said 'Let's do a line of credit, kind of like a home-equity line of credit where you only take what you need, and only pay interest on what you need,'" Bullock said. 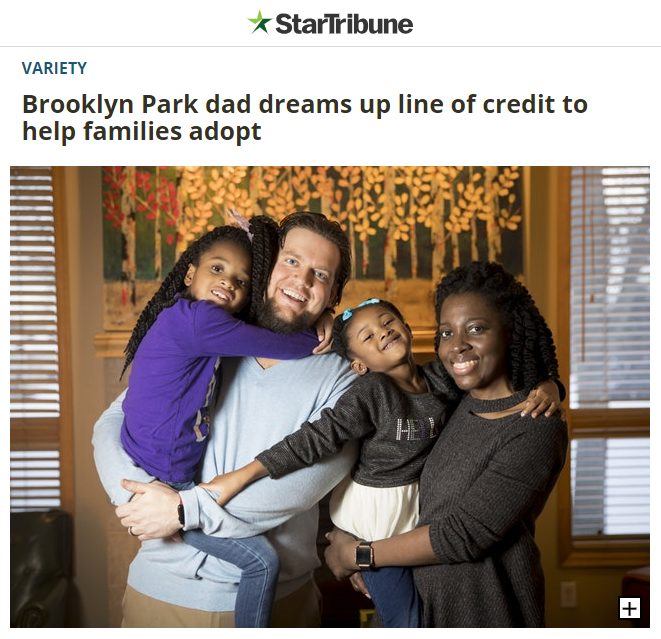 Whether it is the cost or another reason, fewer people in Minnesota are choosing adoption. Below are the latest statistics available from the National Council For Adoption. This has been a busy year for Amy and Derrick Andrist. Unable to have children biologically, they adopted Emmett in March. Within four months of bringing him home, they got another call, this one about little Edison. "Our plan was to adopt one baby, and it was quite the journey, and plans change and we were blessed to adopt two baby boys," Amy said. The cost of adopting their now-8-month-old boys surpassed $100,000—creating a huge financial concern. "You go back to your bills and look at what can we cut, what do we need to cut, we'll do whatever it takes... we'll do anything for a child," Derrick said. That's when their bank told them about Firefly Credit Union's adoption loan. "You have a certain amount that you qualify for, and then the funds are available as you need them," Amy said. The newly-created Andrist family knows they have much to be grateful for this Thanksgiving. "Every day you can have a good or a bad day, but when you come home to those two boys and a beautiful wife, it's just the best ever," Derrick said. For more on resources available to those adopting children, visit the mnadopt page from the Minnesota Department of Human Services. DDJ Myers Peter Myers and Next Top Credit Union Exec winner/MAX Credit Union VP Organizational Development Lynette Cupps joined us in the Studio Lounge to share a behind-the-scenes look at how the NTCUE contestants train for their competition each year. Lynette provides a some examples of how she prepared and executed her videos and presentations, as well as Peter adding how he and his DDJ Myers team guided each of them as finalists. Pretty cool stuff here, setting the stage for these folks to excel in their careers. Blaine Bartholomew, AVP of Member Experience at Unitus Community Credit Union and Next Top Credit Union Exec finalist discusses details of his his Member Rewards Account Program that focuses on the ownership/membership difference, promoting technology and saving, and attracting Millennials. Check it out and let us know your thoughts. Fort Knox Federal Credit Branch Manager Union Clark Duncan, joined us in the Studio Lounge following his conference presentation to further outline his "Flip the Switch" program for future leaders in innovation. Check it out and let us know your thoughts. Lynette Cupps, VP Organizational Development at MAX Credit Union, visited the Studio Lounge following her Next Top Credit Union Exec contest presentation to further describe her project that supports small businesses and community organizations beyond the money. Check it out and let us know your thoughts. Emily Strybosch, Brand Specialist at Libro Credit Union, stopped by the Studio Lounge following her Next Top Credit Union Exec contest presentation to further explain her "Plan with Purpose" app, displaying how we can help members plan for their future and keep them on track to achieve their personal prosperity. Check it out and let us know your thoughts. Jodi Maus, Talent Development Specialist at Central Minnesota Credit Union, stopped by the Studio Lounge following her Next Top Credit Union Exec presentation to further outline her contest project: online Management Courses for executives. Check it out and let us know your thoughts. Another stellar group for CUES 2018 Next Top Credit Union Exec competition. Five finalists delivered five fine presentations in a room full of credit union CEOs ... but only one could win. And that winner is ... MAX Credit Union's VP Organizational Development Lynette Cupps. Congratulations, Lynette! We invited Lynette to the Studio Lounge, along with NTCUE creator and Currency Marketing President and Creative Director Tim McAlpine, to get their reactions on the contest's results -- as well as what this win means for Lynette's project, the $20,000 prize, and advice for future NTCUE competitors. CUES 2018 Next Top Credit Union Exec finalists took the stage to share their innovative ideas that will benefit the credit union industry in more ways than one for sure. Former winner (2015) and now CUES Vice President of Membership Jimese Harkley kicked off the competition, sharing how the contest changed her professional life helping her get to where she is today. Next Top Credit Union Exec Creator and Currency Marketing President & Creative Director Tim McAlpine then commenced with the finalists introductions for the audience and judges to listen to their polished presentations -- and hopefully vote for the one of them as the 2018 champion. First up was Fort Knox Federal Credit Branch Manager Union Clark Duncan, outlining his "Flip the Switch" program for future leaders in innovation. Second was Emily Strybosch, Brand Specialist at Libro Credit Union, explaining her "Plan with Purpose" app, displaying how we can help members plan for their future and keep them on track to achieve their personal prosperity. Third was Jodi Maus, Talent Development Specialist at Central Minnesota Credit Union, outlining her online Management Courses for executives. Jodi plans to develop and implement an eight session “Management” courses customized to the needs of current and future leaders of the credit union. Fourth was Lynette Cupps, VP Organizational Development at MAX Credit Union, describing her project that supports small businesses and community organizations beyond the money. Lynette's project provides cost effective professional development to smaller credit unions, local small businesses and non-profit organizations to support the credit union movement, community advocacy, and employment stability and economic growth. Our fifth and final finalist was Blaine Bartholomew, AVP of Member Experience at Unitus Community Credit Union, sharing his Member Rewards Account Program that focuses on the ownership/membership difference, promoting technology and saving, and attracting Millennials. Check it out and let us know your thoughts -- and stay tuned for the winner announced on Wednesday, November 7. First up is Fort Knox Federal Credit Union Branch Manager Clark Duncan sharing his "FLIP the Switch" project. Clark also discussed why he entered this year's NTCUE contest, as well as career goals, how he sees the competition benefiting the industry, what he's learned throughout the contest's process, and much more. Check it out and let us know your thoughts. Another exceptional group of NTCUE finalists, so lend them your ear and give them some support. More than likely, they are our industry's future leaders. Our next Next Top Credit Union Executive finalist is Emily Strybosch, Brand Specialist at Libro Credit Union in London, Ontario, Canada. Emily's project consists of how might we help credit union members ("owners" in Canada) plan for their future and keep them on track to achieve their personal prosperity. Fascinating topic for sure. So take a few minutes and check it out and let us know your thoughts. In our continuing coverage of CUES Next Top Credit Union Exec finalists, we talk with Jodi Maus, Talent Development Specialist at Central Minnesota Credit Union. Jodi joined us to discuss her competition's project Management Courses for credit union employees looking to enhance their careers. Jodie's 8-session “Management” courses are customized to meet the needs of current and future leaders of credit unions nationwide. Check it out and let us know your thoughts. In our continuing series of featuring CUES Next Top Credit Union Exec finalists, we chat with Lynette Cupps, VP Organizational Development at MAX Credit Union. Lynette's project involves supporting small businesses and community organizations beyond the money -- certainly a different twist here. Lynette's plan is to provide cost effective professional development to smaller credit unions, local small businesses and non-profit organizations to support the credit union movement, community advocacy, and employment stability and economic growth. Two Minnesota families are helping others find funding for their forever families. Deciding to grow your family through adoption is one of the biggest and most impactful choices you can make — not to mention one of the most expensive. On average, the cost of raising a child is upward of $200,000, and adopting a child in the United States can set parents back between $35,000 and $50,000. The steep cost of adoption can be a barrier that prevents parents from even setting foot in an agency. 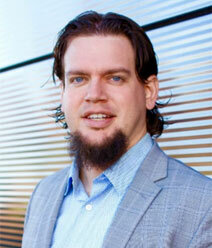 Firefly Credit Union’s Geoff Bullock is an adoptive parent who knows the process is challenging. Firefly Credit Union aims to make adoption more accessible to families by easing the financial burden the process entails with its new, low-interest adoption loan program, launched in February of 2018. As an adoptive parent himself, Bullock has firsthand experience with the intimidating price tag and complexity attached to the adoption process. Bullock noted that, while other institutions throughout the US offer adoption loans, Firefly is unique in offering its borrowers an unsecured fixed-rate line of credit with flexible repayment terms. “There are other institutions nationwide that have versions of adoption loans, but they’re all installment loans — and oftentimes they require collateral. One of the things we found is that not everyone has the collateral they might need to cover a forty-something-thousand dollar loan,” Bullock said. Amounts for Firefly Credit Union’s adoption loans start at just $5,000 and can reach a maximum of $40,000. Upon approval, borrowers have 24 months to access funds, and begin repaying the loan after funds are first used. “With installment loans, if you take out a $40,000 loan, you have to pay interest on $40,000 the first month you’re paying the loan back. Instead of doing an installment loan, we have a line of credit. You do two years to lock it in, and then you pay 1.5% of the balance back,” he added. The credit union estimates that families who borrow the maximum $40,000 amount and pay back the minimum balance can expect to repay their loan in full within 89 months. When Firefly Credit Union launched its adoption loan program in February, it had partnered exclusively with two adoption agencies, the Children’s Home Society and Lutheran Social Services of Minnesota. Firefly recently extended its loan eligibility to include families whose adoption applications are approved by other agencies. “We still verify and approve the individual adoption agency to make sure they’re a trustworthy place, but it’s expanded to be not just the Children’s Home and Lutheran Social Services anymore, which is a very exciting development,” Bullock said. The complexity of the adoption process, especially in the case of international adoptions, often means that multiple agencies will be involved in a single adoption. This is because each agency is offered only a few “adoption slots” from each country, which sometimes necessitates collaboration across multiple agencies to bring a child to his or her new home. Firefly Credit Union’s adoption loan program exists to provide a brighter future for the children who need forever homes with loving families. From the moment kids arrive home to their adoptive parents, Firefly embraces them into the credit union culture by making a $500 deposit to an FFCU savings account in the child’s name. At its heart, Bullock said Firefly Credit Union’s adoption loan is focused on people rather than profit. “When people ask, ‘How did you make the interest rate that low?’ and ‘Why are you giving a gift at the end?’ the answer to a lot of it is because we care about the people. It’s really a people-focused product,” he said. BURNSVILLE, Minn.–Firefly Credit Union has introduced a new Adoption Loan it said provides the opportunity to further support families in the communities it serves. Once a family is approved through an accredited adoption agency, they can take advantage of Firefly’s new loan. As a welcome gift to help families celebrate and get settled in with their new addition, Firefly said it is offering to deposit up to $500 in the member’s account. “As an adoptive parent myself, I know firsthand the vast financial hurdles that stand between parents and children,” said Geoff Bullock, Firefly’s community engagement and education specialist. “It is a pleasure to be part of an organization that extends their support to all families, for all purposes. Info on the program can be found at fireflycu.org/adoption. Public voting has ended and CUES Next Top Credit Union Exec (NTCUE) has announced its Top 10 applicants for 2018. The NTCUE competition–held in partnership with DDJ Myers and powered by Currency–searches for emerging leaders age 35 and under from within the credit union industry. The top five vote-getters automatically advanced to the Top 10 phase, and five additional applicants were chosen by a special judging panel of former NTCUE finalists to round out the Top 10, CUES said. CUES said the Top 10 will now submit a blog post update about their project to NextTopCreditUnionExec.com. To provide additional value to the competition experience, they’ll each receive an executive coaching session from DDJ Myers. A judging panel of two CUES members and Deedee Myers of DDJ Myers will then score the Top 10’s applications and blog posts, narrowing the competition to the Final Five, who will move on to the finals. The five Finalists will receive additional coaching, airfare, accommodations and registration to CUES’ CEO/Executive Team Network, Nov. 5-7 in Nashville, where they will give their final presentations. The winner will receive further coaching, airfare, accommodations and registration for two CUES’ CEO Institutes, a total prize package valued at $20,000.